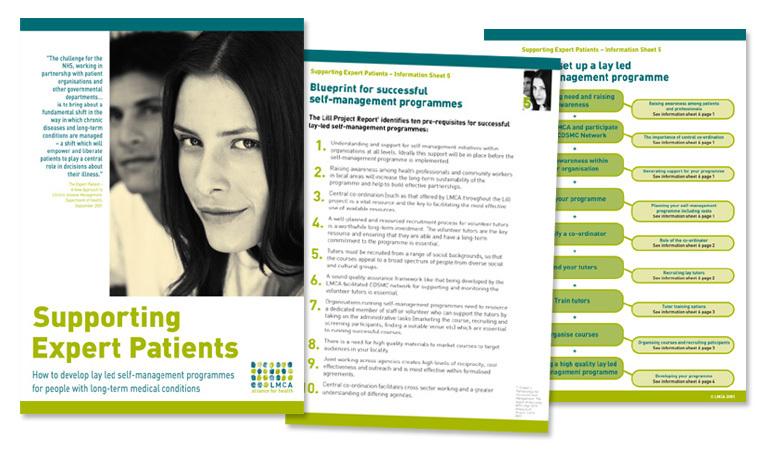 The LMCA required a resource pack to help set up an expert patient programme to support people with long-term medical conditions. We created a folder with loose leaf inserts so that, as the programme developed, information could be updated without the need to re-print the whole resource pack. The image on the front of the pack presents a positive message to patients suffering from chronic long-term conditions. By avoiding the stereotypical "suffering" message all too typical of this kind of initiative, the aims of the programme are enhanced and reinforced. The sheets were laminated to ensure they were robust. They are virtually unrippable.